Our little school is part of the Saints John & Martin's Roman Catholic Parish of Balsall Heath. Our parish priest is Father Dominic Innamorati SCJ BA. For more information on our parish, you can visit the website ​www.ssjohnandmartin.org.uk. ​A youth club is held every Friday from 7pm for children aged 6 to 18 in the Parish Hall. All are welcome to attend. ​Thank you to all the children who, on Friday 15th February, in exchange for wearing trainers made a donation. £114 were raised that will go towards our parish helping two or three parishioners with long term sickness to go visit Lourdes this year, along with nurses. 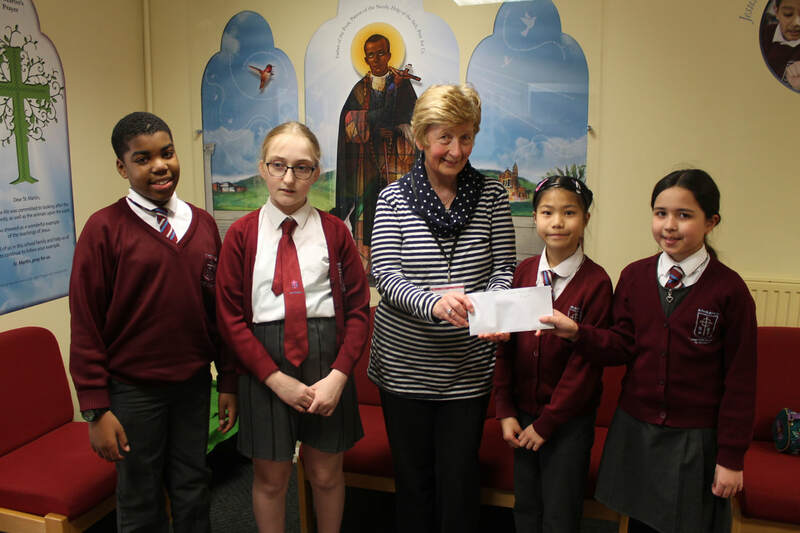 On Wednesday 27th February, Mrs Blackwood, representing the parish, came to our school to collect the money raised. ​​Our Parish Christmas Fayre took place on Saturday 8th December from 12 to 2pm at the Parish Hall on George Street B12 9RG. ​Thank you to our Irish Dancers for performing at the Fair. They were fabulous! Thank you to the parents for their support.